The CRGC is actively engaged in research studies and a full range of activities that support use and dissemination of cancer registry data. In addition to CRGC studies, the CRGC enables access to cancer registry data for bona fide researchers, and prepares data for use in research, including data linkage, patient-contact studies, and analyses. For more information, select the tab, Data Access and Disclosure. Through the Survey Research Group, the CRGC also offers services to conduct scientific health-related surveys, case-control studies, key informant interviews, focus groups, web surveys, and both longitudinal and retrospective studies using cancer registry data. 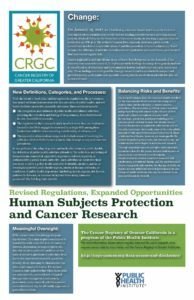 Our Publications and Fact Sheets illustrate a sample of our research interests and our efforts to convey the findings of research using cancer registry data to our constituents in California’s diverse communities. Create customized maps and tables using cancer registry data. Visualize cancer incidence across the population living in California. 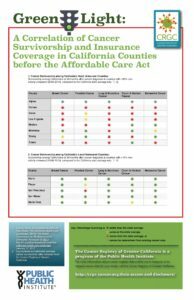 Examine incidence and mortality rates by county or region. Collaborate to develop graphics for dissemination that express findings in compelling ways for broad audiences. Receive guidance on the ethics of using cancer data in research and compliance with laws and regulations for medical privacy and the protection of human subjects. The CRGC partners routinely with individuals and research institutions to advance cancer research. Critical research studies using CRGC data facilitate informed decision-making about cancer prevention, care, treatment options, and policy. 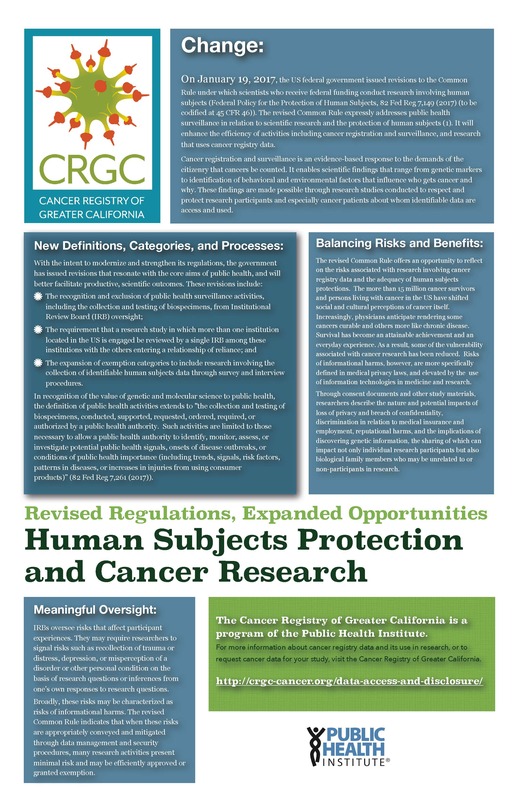 If your study would benefit from cancer registry data and/or the expertise to interpret and analyze cancer registry data or link these data with other data to more fully understand the data or explore hypotheses about cancer incidence, contact our research team by emailing research@crgc-cancer.org or calling (916) 779-0300. The CRGC offers cancer researchers robust cancer data about cases since 1988 occurring within the regions it serves. Inclusion of the most recent cases is limited only by the speed of cancer reporting which is increasingly expedited by advances in cancer reporting technologies and processes. 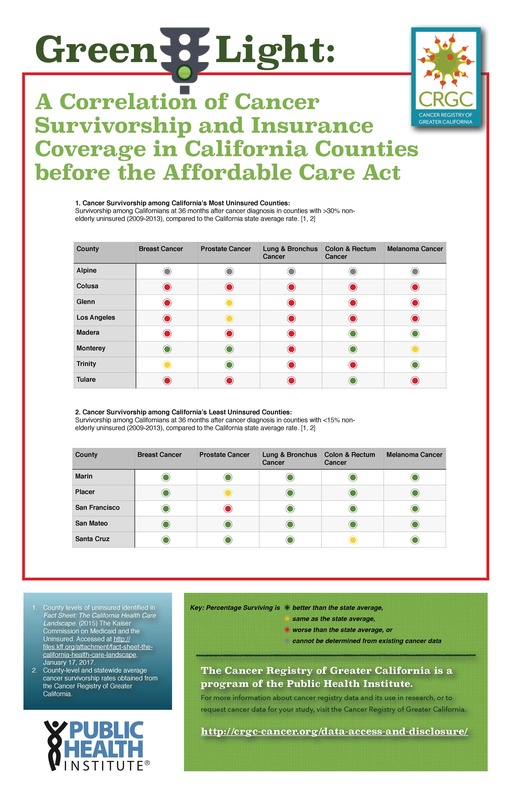 De-identified, aggregated data sets contain extensive information on cancer diagnoses, treatments, and survivorship for more than one million individual cases in California. Confidential cancer information (i.e. identified cancer cases) is available for research through our program for Data Access and Disclosure. The CRGC monitors the incidence of cancer in the regions it serves. There are times when members of the public become concerned about cancer in a particular place or setting, usually prompted by an apparent high level of incidence. CRGC staff perform probability analyses in response to such cancer concerns. Using cancer registry data, CRGC staff can determine whether there is a higher than expected incidence of cancer for a particular locale. If you have questions or concerns about cancer incidence, please visit our staff page and contact the epidemiologist for the region in which your concern is located.